Where are chefs finding inspiration for their food? What cooking trends and technologies have been inspiring them recently? How far they come in their quest for sustainability? Our monthly Winnow Chef's Table series we will bring you interviews with chefs from all over the world who share some insight into their culinary origins and philosophies. 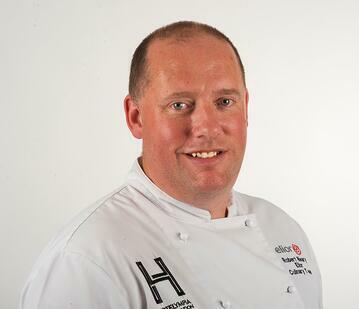 In our sixth edition of the monthly Chef's Table, Robert Neary, Development Chef at Elior shares his inspiration to become a chef and much more. Chef Robert started his career in hotels and moved into contract catering in 1994. Since then he has worked for different contract caterer companies including High Table, Sutcliff Catering, Restaurant Associates and Baxter Storey. He joined Elior in 2012 as Development Chef. Food: I love eating it, learning about it and producing it. While I was at school it became clear to me that I could not choose anything else as a career path but cooking. I did a Youth Training Scheme at Ware Collage for 3 years. Later on in my career I did a Diploma in Culinary Arts at Thames Valley University. But as most would agree you do most of your learning on the job and I have been lucky enough to work with some very good chefs in the industry. Any change in a kitchen is a challenge because we all work under huge pressure. We have set ways of doing things and to change that can be a challenge. Most of the Chefs don’t see the benefit of food waste reduction. They think they don’t have the time to manage waste or that they already managing food waste efficiently. The Winnow system is such a great tool. You can see on a daily basis how much food waste we had and where the waste has come from. In a position like mine with staffing structures as they are now I could never manage the waste effectively without Winnow. Once we established what our food waste was it gave us an opportunity to implement initiatives in every area. We have reduced service times in some areas, we have changed menu cycles on salad section, we have reduced our production numbers which in turn has reduced our labour pressure. Technology has already had a missive impact on our customers from being able to research dishes and watch how to make them to being able to review chefs and their restaurants from their phone. In our industry it is also now giving the customer the opportunity to order food from us online to be available when they want. They can even take the food at home to cook for themselves and families in the form of BoxdChef, a new Elior concept to further enhance our offer. I work closely with the Elior central development team who research and launch up to 10 new concepts a year. I also follow chefs on Twitter and Facebook. I eat out as much as possible and this year I have the opportunity to travel to Vietnam with Elior on a Culinary tour of the country. We are always striving to become more sustainable. We use Winnow to cut our food waste, our remaining waste is turned to grey water instead of going to landfill. We have reduced our consumption of disposable cups by 40% by introducing Keep Cup. Use Winnow to help you. Jamie Oliver - he makes great food and uses his profile to do good within the food industry. Persian food. The use of floral flavours mixed with spice’s and BBQ cooking techniques is very interesting. About 10 years ago I was taken to a restaurant called Verd i Vent just outside Alicante, Spain. It was an old cow shed on the side of a mountain, set menu with help yourself barrels of wine. All the food was cooked from what was available on the day, served family style. It will always be the best meal I have ever had. That’s very difficult to say but a simple sea food dish. I was lucky enough to have a lobster salad in the Windows on the World in New York that sticks in my mind as a great dish. Local street food whatever country you are in. You will find a gem of a place to eat.